It’s Black Friday and the 2009 holiday season is “officially” underway. Retailers are hoping for higher online sales, but paradoxically, will most likely see higher-than-average rates of cart abandonment. SeeWhy, a company that tracks shopping cart abandonment rates, reports the average across industries in October 2009 was 71%). But if your abandonment rate is 71%, it doesn’t mean you’ve lost 71% for good. (If you’re an email subscriber with images off, please turn them on to see the survey graph). Whether the customer is comparison shopping, “sleeping on” the decision or using you cart as a lazy man’s (or woman’s) wish list (and who can blame them when most wish lists require account registration), it pays to hold the cart contents. An abandoned cart does not mean a lost sale. A ScanAlert study found 28% of shoppers took longer than a day to convert, and 14% longer than a week. Granted, the study is 5 years old, but decision making doesn’t necessarily change because ecommerce websites have advanced. The point is many conversions happen after 2 or more days or visits. And to complicate matters, many convert in a subsequent reporting period – a November visit converts in December, but is not accounted for in the November conversion report. Make sure you’re leaving persistent cookies for Santa customers that hold contents in the cart, and you’ll want to set these cookies to hang around for at least 30 days. You’ll have a better chance of converting customers who take longer to make their decision and who expect to find their carts in tact when they return to your site. Holding a cart’s contents across sessions – sounds like a no-brainer, right? 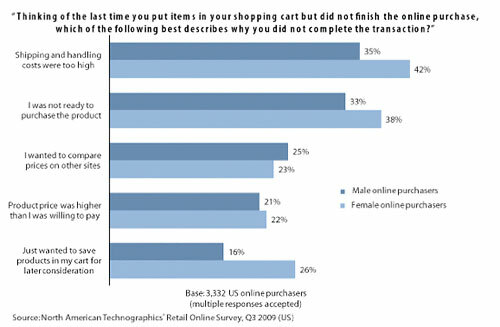 In 2007, the E-tailing Group found that 29% of top online retailers did not use persistent shopping carts. Has that number improved in 2 short years? I did a quick test on 50 of the Internet Retailer Hot 100 and 7 did not hold my cart overnight, or 14%. Still, that’s 14% too many! One feature that I really appreciated as a customer was seeing the quantity or dollar amount of items in the cart, clearly. When returning to the site, I want to know without digging that my cart was saved. Another tip is to measure your customer behavior including repeat visits and conversions across reporting periods. Longer cookie durations help you track that accurately. MineThatData’s Kevin Hillstrom shares his tips on how to measure conversion rates across time on his blog. To get the best picture of what your true holiday performance is, you need to factor in customer behavior, provide the usability to support multi-session shoppers (persistent cookies) and understand what metrics to track and how to track them.